Comprehensive tax reform took a big step forward with the passage of a Senate bill in the early hours of Saturday morning. As House and Senate lawmakers now work on hammering out a single version of the legislation, senior housing stakeholders are speaking out about their top concerns–including, notably, a provision that could deal a major blow to continuing care retirement community (CCRC) construction and renovation projects. The root of the issue is that Congress is looking for “pay-fors,” or ways to offset the potential $1.7 trillion increase in the federal deficit that the bill could cause. One such pay-for might be eliminating tax-free Private Activity Bonds (PABs). These are tax-exempt municipal bonds that form a crucial funding foundation for non-profit developers of continuing care retirement communities (CCRCs). Eliminating PABs might not only constrain CCRC development and renovation at a time when the asset class is booming, it could also affect strategic decision making for real estate investment trusts (REITs) in the senior housing and medical office sectors. The PAB provision could essentially bring any plans to build or renovate CCRCs among non-profit operators to a halt, LeadingAge is warning. 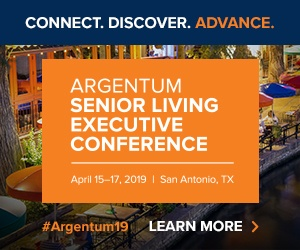 “For our members, it really guts the major source of capital for them,” Steve Maag, LeadingAge’s director of residential communities, told Senior Housing News. The group, which represents non-profit long-term care providers, has come out strong against the legislation. Without this source of tax-exempt cash, providers in the space could see their costs of capital increase by a third, Maag said, and kneecap the industry’s ability to expand for the next five years. “This would clearly impact the development of new campuses and the cost for new campuses, and the bottom line is that the consumer ends up paying for this whole thing,” Maag said. While non-profits could hypothetically access the commercial lending marketplace, those bonds would be taxable, and thus less appealing — and because non-profits by definition do not have equity in their properties, these developers and operators would be shut out of the private equity market entirely. In one example of how this could all play out, a nonprofit CCRC in Bloomington, Illinois, is currently using PABs to fund a $33 million expansion project, and is considering its options should they be eliminated on Jan. 1. As of Dec. 4, Westminster Village had only drawn $10 million of its $30 million loan, so the remaining $20 million would be smacked by the higher financing costs if the House version of the bill were to pass. That would cost the CCRC an extra $3.4 million, CEO Barbara Nathan told a local National Public Radio (NPR) affiliate. Now, Westminster must decide whether to draw the remaining $20 million early to avoid that tax hit — though the CCRC would have to pay an extra $340,000 in interest even in that best-case scenario, Nathan told NPR. Maag and LeadingAge have also expressed concerns about a provision, included in both the House and Senate versions of the bill, that would eliminate so-called “advanced refunding.” This practice allows holders of PABs to refinance once during the first 10 years of the bond issuance. Because investors generally require higher interest rates during the early stages of a project, when success is less clear, non-profit developers frequently take advantage of advance refunding to secure lower rates once portions of a CCRC have been completed, Maag said or simply when overall interest rates decline. In addition to LeadingAge, the American Health Care Association (AHCA) — which represents for-profit long-term care operators — came out against the PAB repeal back in November, citing the bonds’ utility in renovating infrastructure and building affordable housing units. With the bill set to enter the reconciliation process, the PAB language’s inclusion in the final bill remains uncertain, and its popularity among Republicans is far from unanimous. Rep. Randy Hultgren, an Illinois Republican who co-chairs the Congressional Municipal Finance Caucus, wrote a letter to Senate and House leaders urging them to drop the PAB repeal from the final bill. Twenty of Hultgren’s GOP colleagues co-signed the letter. Senior housing REITs might also be changing their strategies if PABs are eliminated. The elimination of PABs, for instance, could increase competition from outpatient medical clinics, analyst Richard Anderson of Mizuho Securities USA said in a note shared with SHN. Welltower Inc. (NYSE: HCN), a Toledo, Ohio-based REIT, has discussed expanding its medical office building (MOB) footprint, which Anderson said could have been inspired by the elimination of PABs. Still, Rick Matros, CEO of Sabra Health Care REIT (Nasdaq: SBRA), remained upbeat about the future of senior housing REITs under the new tax plan. “We don’t see anything that will negatively impact REITs or the skilled and senior housing space,” Matros told SHN.